– Animated home screen with customisable characters and an easy to use interface. – Exclusive applications for your children including a fun camera, voice changer and colouring book. 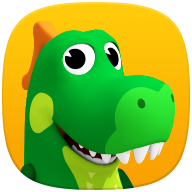 Various applications sorted by age and category available in a special Kids Store, (where parents authorise the download), including educational apps, fun digital toys, games featuring their favourite TV characters and wonderful story books.